I realised I missed trick on Monday by only including news about the special edition DVD release of The Nativity Story in passing, and not really commenting on the Mark Moring's latest article on the film for Christianity Today. The news about the 2nd DVD is not really surprising. I'm amazed by the number of barebones DVDs people buy new even when it's obvious that a special edition will arrive in the not-too-distant future. I'm never sure whether dual release strategies like this are down to cynical industry marketing, or simply the fact that it takes a while to get a decent collection of extras together, and some people want the DVD as soon as possible. That said the official website store only has the single disc edition advertised at the moment. Moring's article is primarily about the release strategy for the film. There are comments from both director Catherine Hardwicke and producer Wyck Godfrey. Elsewhere, Christianity Today has been fielding reader's comments on why it performed poorly at the box office. (Thanks to Jeffrey Overstreet for that one). Anyway, the story that made me haul out another edition of Nativity News is that Peter Chattaway has produced an audio commentary for the film along with his priest Fr. Justin Hewlett. Chattaway and Hewlett figured that since the current DVD has no audio commentary, and since it's another 6+ months until the special edition will be released, they may as well do their own. It's now available to download (although be aware it's 96MB!). The idea for doing this comes from the great Roger Ebert who way back in 2002 advocated the idea of "Do-it-yourself movie commentary tracks". It's something I'd like to do myself someday, hopefully once I've got used to doing my podcast I can make the transition. 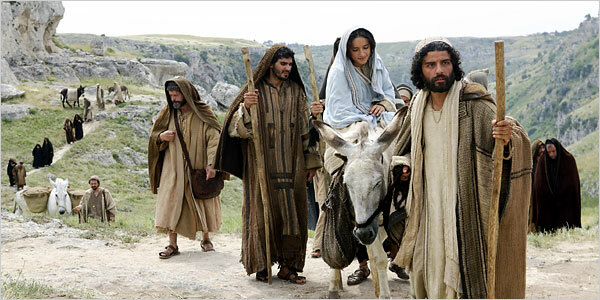 Finally, back in October, the news broke that the star of The Nativity Story, Keisha Castle-Hughes, was pregnant. Two strange things happened shortly afterwards. Firstly, as the readers comments linked to above verify, a number of Christians decided not to see the film as a result. Secondly, someone commented on my blog that they were a friend of Castle-Hughes, and that she wasn't in fact pregnant. Whilst it would have been great to have such a scoop on this blog, it seems fairly certain that the comment was a red herring. As the baby should be due any time now I've done a bit of searching for news, and Celebrity Baby Blog had a picture of her from before Christmas with a very visible bump. 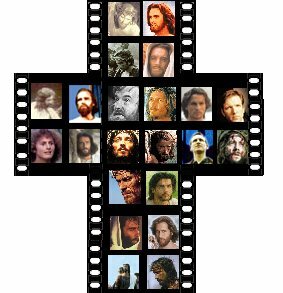 I've discovered a number of articles on Jesus in film recently, and have finally added them to my sidebar. Sadly they replace Pete Aitken's pages as the Post Fun website which seems to be no more. I should clarify that these are articles which offer a survey of a number of Jesus films in one article, rather than the numerous articles which discuss a particular Jesus film. John J. Michalczyk of the Boston Globe illustrates his article with this collage which I rather like. It dates way back to February 2004, and you have to register to read page 3, but it's a decent overview to the the subject covering all the usual suspects. Robert Fontenot at Audience Magazine was also from spring 2004 (i.e. 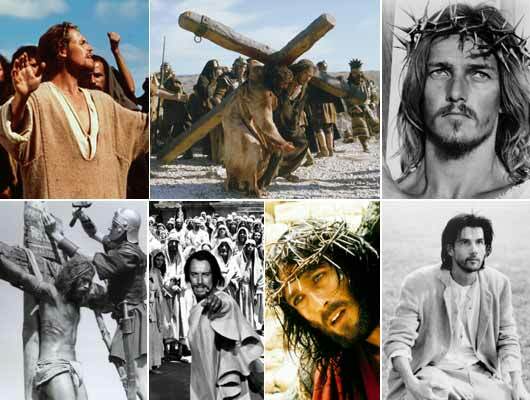 the time Gibson's The Passion of the Christ was released). Fontenot grades 9 films on "Historical Authenticity", "Violence", "Treatment of Jews" and "Overall presentation" - obviously categories particularly relevant to The Passion. It sticks with Jesus biopics and excludes those who deviate significantly. Alexandra Alter (Pantagraph) offers one of the few forays into this area by female writers (only 3 of the 15 survey articles I know of are by women). Alter's article starts by previewing some of the forthcoming films looking at religious subject matter, whether reverently or irreverently, before listing 15 Jesus films from the past. 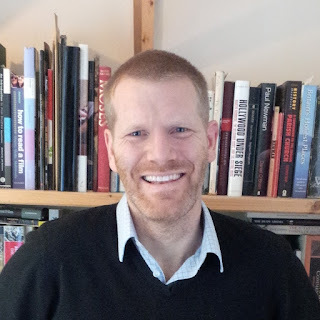 I almost excluded Kim Paffenroth's Film Depictions of Judas article from the Journal of Religion and Film as it's really about Judas rather than Jesus. But such articles are relatively few and as it's certainly of interest to those studying in this area I decided to include it at the last minute. Also from the Journal of Religion and Film is Filming Jesus: Between Authority and Heresy by Paul V. M. Flesher and Robert Torry. Flesher and Torry's comparison between Jesus films and Targum is quite important and I understand that they are going to flesh it out more in their book on the subject due for release this summer. The last couple of links are lists rather than surveys. Glenn Patrick Buxton lists 100 different films which are of relevance to The Gospel of John (2003), several of which I've not heard of. I'm not convinced all of them have that much to do with Jesus - Woody Strode's Black Jesus is listed but has very little to do with the historical Jesus. Nevertheless it's good to possibly find Jesus films that I've not heard of. Finally, a similarly large number of Jesus films are listed on the Caixade de Fantasia site. 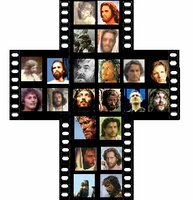 About half are accompanied by a thumbnail of the actor playing Jesus, and the films are ordered by Jesus actor's surname which makes it rather difficult to navigate. Ever since I made the switch to blogging in what was called "Beta", I've been gradually adding labels and planning a time when I could have a page with all the labels in one place. I didn't really want them in my sidebar (as there are already 72! ), so I've now placed them in one of my archive pages, and placed a view all labels tag link in my sidebar. In time I'll be breaking these down into more manageable categories. Way back in October, Peter Chattaway posted about Eric Idle's plans to turn Monty Python's 1979 Jesus film Life of Brian into a musical. There have now been a number of articles on this show, which is to be called Not the Messiah (He's a Very Naughty Boy). Playbill reported on it back in October, then Variety covered it last month, and then yesterday Peter linked to The Globe and Mail (although you have to pay for that last article). Following the success of Idle's "Spamalot", he is, once again, collaborating with composer John Du Prez. However, according to The Globe and Mail article the show's première will be conducted by Idle's cousin, Peter Oundjian - the musical director of the Toronto Symphony Orchestra. Not the Messiah is due to open at the Luminato Festival of Arts and Creativity in Toronto on June 1st. But notably, according to this latest article at least, this production will not actually be a musical. It will be an oratorio (a non-costumed, non-acted, concert performance usually dealing with religious subject matter) and it will use 40 musicians and 4 classical singers. Idle notes how it it unlikely to cause offence as there is no crucifixion scene. It's "good-natured playing with the concept of [Handel's] Messiah" as much as anything else. I love the thought of Idle still giggling to himself at the central concept of Life of Brian almost 30 years later, and it's good to see him exploring more challenging forms and material. I have a lot of respect for artists who continually push themselves and their work in new directions. There are a number of Bible films that have recently been released on DVD which I've yet to pass comment on. Firstly, episodes 1 and 2 of the children's animated adventure series Friends and Heroes has been released. Friends and Heroes is currently showing at lunchtimes on CBBC. Initially, the DVDs are to be released through the official website. A Friends and Heroes DVD Club has also been set up for those wanting to get the whole series. The site also includes the release schedule for the remaining episodes, the next of which is released on 14th May. Releases of Series 2 will begin on the 21st January 2008. Secondly, one of my favourite Jesus films, the animated film The Miracle Maker, was somehow re-released on the 6th March in a special edition without any of my usual sources or me noticing. That is, until my friend Steven D Greydanus of Decent Films found out. Steven also tipped off Peter Chattaway who has posted some interesting comments about the new DVD at FilmChat. The main extra that this disc has is a commentary with Derek Hayes (one of the directors) and one of the producers. Last week, Peter also noted that the release of The Final Inquiry appears to have been delayed - a date is no longer given on the FoxFaith website. I have also discussed previously the forthcoming releases of a The Gospel According to St. Matthew (colourised version) (26th March) and The Nativity Story (20th March). Occasionally I come across these rarities on eBay, and like to pass them on to anyone who shares my interests, but has more disposable income than I. Anyone in that category may be interested to know that there there is a 16mm version of The Last Days of Pompeii (1935) for sale on eBay. This is the most famous version of the story, but as I was already aware of several others I thought I'd check the IMDB. There are actually 24 existing productions with the word with at least one film (named simply Pompeii) scheduled for 2008. Not all of these will be directly linked to the events of 79AD (for example Pink Floyd: Live at Pompeii), but nevertheless it's a considerable number. There are only 2 films with Herculaneum in the title (and one of those is a documentary). Krakatoa does do slightly better though. The most recent Pompeii related film is the BBC's 2003 documentary Pompeii: The Last Day which featured some dramatic footage, and was narrated by F. Murray Abraham. What is notable is that even when not adapting Edward Bulwer-Lytton's novel, as with this documentary, film-makers still prefer Pompeii to Herculaneum. Perhaps the next most famous version is the 1959 Italian version of the novel, Gli Ultimi giorni di Pompei starring Steve Reeves. This is actually the only version I believe I have seen, although, since I was very young at the time, I may be confusing it with another version. I'm fairly sure though, that it wasn't the much loved British period sitcom Up Pompeii, starring Frankie Howerd. Another, notable version of the story is the 1984 Mini-series Last Days of Pompeii starring Brian Blessed, Ernest Borgnine, Olivia Hussey, Anthony Quayle and Laurence Olivier. It's an impressive cast and has a good following including a dedicated fan site. Sadly it'snot available on DVD. Funnily enough, Pompeii itself has always been place close to me heart. My dad visited it when he was young (and before excavations were as advanced as they are today), and he took a good number of slides which made for an exciting show when I was young. I seem to recall taking them into school as well when we were studying the Romans. I was reminded of all this when in my search for images to illustrate this post I came across a German web page with a number of photos of Pompeii. For a number of years now, I've been a member of the Faith and Film Critics Circle. It's an important group for me to be part of, and as I'm one of the more junior members it's great to be part of something bigger than myself, as well as having a place where there are people of much more experience than me that I can learn from. I should add a few notes. Some may wonder why we have included The New World when the Academy classed it as a 2005 film. To be honest we don't really understand why the Academy did this. Whilst a version of this film was screened in a few places in 2005, the version that was finally put on general release was a different cut, and that wasn't seen until January 2006. It makes sense, to us at least, to consider this as a 2006 film. To me, any other approach would reek of exclusivity. Secondly, the voting procedure was led by Jeffrey Overstreet(pictured), and Ron Reed. I'd like to thank both of them. Jeffrey has served as chair of the FFCC for a long while now, but recently decided to step down to focus on other projects. Jeffrey's done a great job, and been a great inspiration to me personally, so I'd particularly like to thank him for all his work, and I'm looking forward to his continued presence as a member of the group. There's a full list of all the members of the Faith and Film Critics Circle, as well as details of how you can join us at our website. (Thanks to Zac Kincaid for all his work on the website). Hyde Park has hired scribe Paul Aiello to pen the script, which will center on the apostle Peter in telling the story of the time between the resurrection of Jesus and the Pentecost... Risen does not yet have a distributor, although Hyde Park has a deal at Fox...Amritraj said the time is right for faith-based entertainment considering the chaotic state of the world. "And then secondly, clearly, I think there is a commercial marketplace and need for movies that have hope and values," Amritraj told Daily Variety. "It's a big deal for us." Hyde Park intends to pursue other such projects. I must admit that my head is spinning with the glut of films clambering over one another to claim the prize of rightful heir to The Passion of the Christ's throne. Peter lists three. L'Inchiesta / The Inquiry / The Final Inquiry features Hristo Shopov reprising the role of Pilate which he played in The Passion of the Christ. Screen Gems and Tim LaHaye are producing The Resurrection(Peter notes that the release date for this has now slipped to 27th Feb. 2009). Finally, he lists German / Canadian production The Sword of Peter, which I've not got around to blogging just yet. On top of all this Peter also noted back in December that The Weinstein Company's Genius Products is due to release a DVD called Resurrection. It's supposedly based on a Max Lucado novel which suggests it will be a re-issue of Resurrection (1999) which Andrea Jobe adapted from a short story by Lucado. (As opposed to the Christopher Lambert one or the one directed by Jake and Maggie Gyllenhaal's father Stephen). Whilst the devil never quite seems to get the leading role in a movie, he is certainly a frequently used member of the supporting cast in two particular genres – the horror film and the biblical epic. Leaving the horror genre to those better equipped to comment on it I thought I would make a few comments on the portrayal of Satan in Jesus films. Since the main place that the devil appears in films about Jesus is his temptation in the desert, that will be the main focus. The earliest silent films didn't really have much room for the temptation scene. The lack of sound meant that dialogue could only be conveyed by using intertitle cards whilst the actors mimed. Wordy episodes like the Sermon on the Mount, or the temptation in the desert didn't really work with these restrictions so such episodes tended to be either ignored, or only dealt with briefly. The first major American Jesus film to cover this material was Cecil B. DeMille's The King of Kings (1927). Occurring right at the end of the silent era, DeMille's film started well after Jesus's baptism and temptation, but inserted a temptation into the clearing of the temple scene. Satan takes human form, but his dark attire makes it clear to the audience who he is. He troubles Jesus with a single temptation – to gain the kingdoms of the world by bowing to him. Jesus refuses, and shortly afterwards is able to resist a similar offer from Judas and the mob that accompanies him. The portrayal of the devil as a human is actually the standard approach for the Jesus biopics. One film that deviated from this norm was Nicholas Ray's King of Kings (1961), here there is no external figure, we simply hear Satan's voice and see Jesus's reaction. Satan's voice, however, is different from that of Jesus. So whilst this film depicts Satan as internal rather than external , he is still distinct from Jesus as such. In a similar manner to DeMille, Pasolini uses a darkly dressed human figure to tempt Jesus in the wilderness. As this film is portrayal of The Gospel According to St. Matthew the conflict between Jesus and the devil uses first evangelist's dialogu almost word for word. 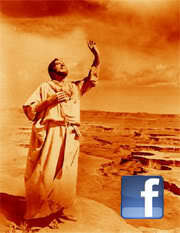 Jesus's time in the desert is brief, dealt with matter of factly before Jesus goes about starting his movement. Jesus's rejection of the devil's temptation to gain power aligns well with Pasolini's marxist agenda. Arguably the most interesting and thorough portrayal of Satan comes in George Steven's Greatest Story Ever Told. Here Satan is credited as "The Drak Hermit" and played by perennial evil actor Donald Pleasance. As Jesus climbs the crags of the wilderness he encounters the hermit in a cave. The two talk for a while before Satan begins to tempt Jesus. This non-confrontational approach is more beguiling as opposed to the confrontational methods used in other films. Unlike other Jesus films, The Dark Hermit appears later in the film also. At a later stage he tries to encourage the crowd to make Jesus the messiah by giving him a messianic title in their presence. As the story draws to it's climax, the hermit makes two final appearances, near Judas as he contemplates suicide, and stirring up the crowd that condemns Jesus to death. The seventies films largely ignored the temptation scene and the corresponding mentions of the devil. 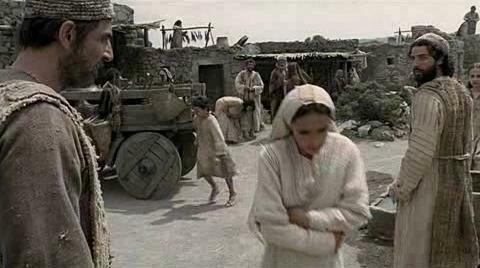 This was understandable for Jesus Christ Superstar which was essentially a passion play, but it is strange that such a long, detailed look at the life of Jesus such as Jesus of Nazareth should omit this episode as well. Ironically, this was the time when Satan's popularity in the horror genre was really beginning to come into its own. Away from the increasingly materialist west, the 1978 Indian Jesus film Dayasagar developed the tradition in a new direction. Its Jesus was not a human figure, but a far more mythical looking beast, albeit one of a similar height and shape to an adult man. Aside from his appearance, the encounter with Jesus is fairly standard, but whereas film's such as Ray's could be read as denying the reality of Stan, Dayasagar depicts the spiritual realm as equally real as the physical world, and as fully able to interact with it. Perhaps the most extensive treatment of the temptation of Jesus is of course Scorsese's Last Temptation of Christ. Obviously the film's climax is where the devil (portrayed here as a young, innocent looking girl) tempts Jesus to come off the cross and settle for a normal life. But the film also contains a more standard temptation sequence, and part of Jesus's susceptibility to his final temptation arises because the devil appears differently every time Jesus encounters him/her. The temptation scene itself commences as Jesus draws a circle in the dirt and sits in it waiting for God. The devil appears to tempt him in a number of different forms; as a snake with Magdalene's voice, as a lion who sounds like Judah, and finally as a burst of flame with vocals by Martin Scorsese himself. Later on, Jesus is tempted in the Garden of Gethsemane where he appears as John the disciple. The temptations in this film are markedly different from the gospels, focussing more on Jesus's internal dilemma concerning his identity - the movie's major theme. A number of more recent films have also examined the temptation Jesus faced in new ways. The animated film The Miracle Maker switched from its standard 3D animation to its more psychological 2D drawing style for this segment of the film. This makes this section more subjective, it also allows for a smooth transition from the desert to the top of the temple, something the gospels never really explain. The Jesus mini series (1999) combines most of these elements into its version of the temptation. Satan is actually represented by two different human figures. Initially, we see a attractive woman dressed seductively in red. Then she changes into a man who, like Pasolini / DeMille is dressed in black. 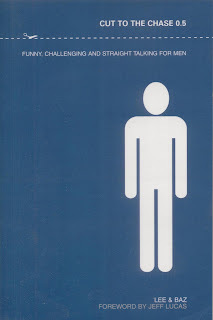 In contrast to the sexual seduction suggested (although not voiced) of the female Satan, the male Satan tests Jesus in a more intellectual manner. For example, the temptation to turn stones to bread is in order not just to feed himself, but all the starving of the world. Like Last Temptation Satan also appears in the Garden of Gethsemane, again trying to tempt him away from his destiny, but in the process handing Jesus a convenient opportunity to provide an apologetic for modern day faith. Interestingly neither temptation appears to be as challenging as the one that faces him at the start of the film - to marry Mary of Bethany and settle down with her. Mel Gibson's The Passion of the Christ also tries to avoid portraying Satan as one particular gender. Whilst Satan is played by an actress, her feminine characteristics are minimised, her hair and eyebrows are shaved off, and she wears a heavy dark robe. The story only concerns the events of the last 24 hours of Jesus's life, so the temptation in the desert story is not a part of the narrative. Nevertheless, Gibson, like Scorsese and Young before him, allows Satan the chance to tempt Jesus in the Garden of Gethsemane. This androgynous Satan figure is also the only film by this point that does not try to befriend Jesus and cajole him into sin. Furthermore, as Jesus suffers his fate, Satan mocks him by parodying the Madonna and child. The 2006 South African modernised Jesus film Jezile (Son of Man) brings a new twist to the film. Not only does this film feature the first black Jesus, but also the first black devil. The film portrays a defiant political Jesus promoting for non-violence resistance to the forces which oppress his people. Jesus's defeat of Satan early in the film captures his saying about binding the strong man in order to plunder his goods. As a beaten Satan roles down the hill, Jesus has struck a decisive blow in the spiritual realm which will impact the physical world he seeks to change. Filmmakers have chosen a variety of ways, then, to portray Satan, but despite this a number of alternative approaches suggest themselves. No film, as far as I am aware has sought to use the voice of the actor playing Jesus to also speak Satan's lines. This move would suggest the reality of the way temptation tends to affect most humans. Additionally, with the exception of Dayasagar, none of these films really explored what Satan, a fallen angel, might actually look like. This suggests there is plenty of scope for creativity in future Jesus films. My review of this film is now up, or you can read all my posts on this film. What is it with the Ten Commandments at the moment? Last year saw Dougray Scott and Paul Rhys star in the new TV mini-series The Ten Commandments (2006). Then later in the year, a DVD was released of The Ten Commandments: The Musical featuring Val Kilmer reprising the role of Moses. Now this year we have The Margate Exodus lined up for a summer release, Dekalog spoof The Ten due in August and now another version of the Ten Commandments looks set to hit cinemas later in the year. The imaginatively titled The Ten Commandments is an animated feature directed by Bill Boyce and John Stronach and produced by Promenade Pictures. Promenade's official website is still under construction, but there is a profile of the company here. It seems the names behind the company are former Paramount President Frank Yalbans and Cindy Bond who is producing this particular film. The Ten Commandments will be the first of six bible themed CGI films known collectively as Epic Stories of the Bible. Curiously, the next entry will go back to the story of Noah with The Great Flood. The film has certainly collected some acting talent to provide the voices. According to the IMDb, Ben Kingsley, who played the lead role in 1996's Moses, will narrate, handing on the part of Moses to Christian Slater. Alfred Molina will play the part of Ramsees, and Elliot Gould will provide the voice of God. New Zealand Global Talent Community Kea have covered this story mainly looking at the success of of the animators for this project Huhu Studios. According to them at least, this film is based on DeMille's 1956 epic of the same title. Edit: Director Bill Boyce comments below that this film will not in fact be based on DeMille's film hoping instead to "portray a humble, human Moses". I'll post more on this as it becomes available. Things are progressing apace with David Wain's Dekalog spoof The Ten. The teaser trailer is now available to view on YouTube and MySpace. It's unusual trailer for a comedy film in that it doesn't really have any jokes (most comedy trailers these days save you the price of admission by giving away all the best jokes). In fact, were it not for this shot of Winona Ryder with a ventriloquist's dummy you might not even get that this is a comedy at all. One moment I particularly liked is the shot of the birds which combines the Egyptian plagues with a touch of Hitchcockian menace. And, for a comedy trailer, viewed on YouTube, the photography looks impressive as well. Following up from last month's post about the new BBC animated adventure series Friends and Heroes, more details have become available, and as the first episode airs in just 4 days (Monday), I thought it was about time I made some more comments. I'll review the episode I was sent as a screener tomorrow. Secondly, it's clear that this project has a good range of talent involved. Gary Kurtz (producer for the original Star Wars and The Empire Strikes Back) is named as the "Supervising Producer". Kurtz has been doing animation for the last 15 years. Other established names are composers Karl Twigg and Mark Topham, who have written a number of UK chart hits for bands such as Steps, Five and Westlife. It's also really encouraging to see Naomi Jones involved. Jones was involved with the brilliant Testament: Bible in Animation series, as well as The Miracle Maker, one of my favourite Jesus films. And then there's Stan Berkowitz who has worked on recent animated versions of Superman and Batman. There are various other names associated with the project, although the only one I really know is Stephen Gaukroger a regular speaker at the Spring Harvest conference over here in the UK. Away from the names and back to the project. As mentioned previously this is the first of three series, and the opening episodes introduce the main characters (Macky and Portia) to us and to each other. Macky is from a family of first century Jewish Christians, whilst Portia is the niece of the Governor of Alexandria - Tiberius. It's Tiberius's meteoric rise that allows each series to take place in a different city. Tiberius's promotion to leader of the siege of Jerusalem moves the action for series two to the heart of Judea, and finally his move to Rome provides the setting for the third series. So there will be something in this for Roman history buffs too (although how accurate a depiction of Tiberius it will be remains to be seen). One final point. The animation will be a mix of 2D and 3D, with the 2D animation making up the majority of each episode, and the 3D being introduced for the sections where the biblical stories are narrated. This is an interesting technique. The use of 3D suggests that these stories are more real than those in 2D, but the way they are narrated stresses the importance of them being stories that are owned and identified with, rather than just stories for the sake of it. As noted previously the episodes in this series are somewhat out of order, hence having just had episode 8 as Jesus Before the High Priest, the story now returns to the Garden of Gethsemane, before jumping forward to the events in front of Pilate and Herod. The Gethsemane episode also features one of the more unusual examinations of Judas (pictured) that I can recall. The last supper episodes are not really included, hence there is little examination of his psyche prior to his betrayal that night (although episode 3 offers a good deal on Judas's motives in the run up to the Last Supper). However, once Jesus is arrested the story switches from looking at Jesus's anguish to that of Judas as he realises what he has done. Stranger still, we do not see Judas actually take his own life. The episode ends with Judas climbing a rocky hill, with only the voiceover to explain what he is going to do. By including in Episode 10 two "trials" before Pilate, as well as Jesus being taken before Herod the film completes the most extensive sequence of trials in any film I can recall. Jesus is taken before Annas, the Sanhedrin at night, the Sanhedrin in the morning, Pilate, Herod, Pilate, Flogging (no direct comment), Pilate, mocking and then death. This sequence is even longer than in The Passion of the Christ. Interestingly though, whilst Jesus is taken away and returns with marks on his chest, there is no direct visual or audible reference to his flogging. These episodes demonstrate the harmonising style of this series taken to its extreme. In addition to the lengthy trial sequence described above, some of the common events that the gospels narrate quite differently find themselves brought together. So the synoptics record Judas as identifying Jesus with a kiss. John has Jesus identify himself with the words "I am he" which cause the soldiers to fall down. Here, Judas kisses Jesus, but before the soldiers can arrest him, Jesus asks them what they have come for, and answers that he is the one they are looking for. We also get both Jesus's speech in the synoptics ("Day after day I sat in the temple teaching,") as well as that from John ("shall I not drink the cup which the Father has given me?"). However, certain details are omitted entirely, such as the fleeing naked man of Mark 14:51-2. Likewise, the final trial before Pilate contains elements exclusive to Matthew, Luke and John. The hand washing and the line "his blood be on us and our people" is solely from Matthew. The incident with Herod and Pilate's qualms about releasing Barabbas specifically are solely from Luke, and lines such as "Behold the man! ", and the veiled threats to report Pilate to Caesar are from John. This is a fairly advanced warning, but I imagine it will interest many of those who have ever found themselves flicking through a Jesus film trying to find the right scene. Richard Walsh ("Reading the Gospels in the Dark") and Jeffrey L. Staley have a new book due out in September 2007 that will make that task a whole lot easier. 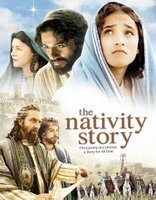 "Jesus, the Gospels, and Cinematic Imagination: A Handbook to Jesus on DVD", summarises eighteen Jesus films available on DVD along with chapter listing, details of extras, a look at the film's genre and socio-political setting, descriptions of the main characters and information on the director. The book concludes with "a harmony of film parallels that lists by hour, minute, and second where each gospel scene can be found on the DVDs". Elsewhere they make the point that DVD technology has fundamentally changed the way this kind of clip surveying can happen because not only is it possible to skip to a precise point in the film, but also, unlike video tapes, the timings are unaffected by the speed of the video player and where you start counting from. All in all this looks like it will be an excellent resource, and hopefully it will far outstrip my Jesus Film Scene Comparison Spreadsheet, which lacks both timings and scripture references (although it does cover 30 films rather than just 18). As I mentioned on Friday I wasn't able to catch the programme on "The Discovery Channel" last night, but fortunately Mark Goodacre did and blogged the whole documentary section by section. It's a pretty comprehensive look at the filmmakers' claim, so I advise you to have a read for yourselves. Mark also has a number of other posts on this story, including a number on the statistical case as well as one where he comments on some of my comments. Elsewhere, Peter Chattaway mentions The Body (2001) a dramatic film about a priest investigating a skeleton which may have been that of Jesus. I've not seen the film, and had forgotten it even existed. Peter certainly didn't think that highly of it anyway. What is up with these buried cities that archaeologists keep discovering? I’m trying to figure out how a city gets buried unless a volcano is nearby. In my house, for example, when the crumbs on the kitchen floor reach ankle height, I start thinking about sweeping. Call me a neat freak if you must, but I wouldn’t just keep eating bagels until I lose the refrigerator. What's strange is how people feel the need to offer serious explanations for the questions Adams poses. Boy, does he know his key demographic inside out. For what it's worth, I also can't help wondering if somewhere along the line, Dogbert is involved in this whole "Jesus Tomb" saga. I've been slightly reticent to post about this film here as firstly, it's been covered in so many other places elsewhere, by people who are far more expert than I, and secondly because I won't get the opportunity to see the film for some time anyway, and by then I imagine that this will all have died down. (My guess is that it will appear at Easter over here, with Channel 4 being odds on favourites to screen it - they did after all show the heavily Tabor influenced The Secret Family of Jesus on Christmas Day this year). I have however posted on it at rejesus where I've tried to restrict my comments to the area of statistics. So I'm going to write about the actual film here, which has tended to be buried amongst the discussion about the subject matter, and I might craft another post at a later stage which looks at some of the arguments. One thing that is clear is that whilst the filmmakers have not given much thought ot peer reviewing their findings, they have certainly spent a lot of effort into putting together a substantial official website. In addition to all the usual stuff, there's a wealth of clearly and simply laid out pages with attractive design. Likewise The Discovery Channel also has a fair bit of information on the film, as well as some more "news" type pages. The film is first due to air on Sunday, March 4th, at 9 p.m. ET/PT. I would guess it would be repeated several times by Discovery. The team that has made the film has been fairly well publicised. James Cameron's (Titanic) name has been all over the news regarding this film, but he's actually only involved as an executive producer, rather than as director. The directing honours go to Simcha Jacobovici (Exodus Decoded) who was also involved with producing and writing. Interestingly he also made James, Brother of Jesus, although I've not been able to find out the conclusions of that documentary. A number of theologians and archaeologists are also involved, although it seems that the degree to which they have been involved, as well as the extent to which they agree with the filmmakers conclusions. So James Tabor agrees enough to have reversed some of his previous positions from The Jesus Dynasty, whereas Amos Kloner is standing by his original claim from 1980 that there was not an ossuary in this particular tomb inscribed "James son of Joseph, brother of Jesus". Darrel Bock claims to have seen the script at an early date, but not to really have been involved, and L.Y. Rahmani’s ossuary catalogue seems to have been a key source. John Dominic Crossan's name also appears on the official website, but it's far from clear how closely he has been involved. Finally there are a number of other experts involved. François Bovon and Shimon Gibson are also named on the discovery site. In terms of experts from other disciplines, one key "witness" is Dr. Andrey Feuerverger - Professor of Mathematics and Statistics at the University of Toronto. He is the statistician, although it's difficult to know what kind of information he was given to work with. Did it really justify a professor, or did they just need someone with good reputation to lend the project some credibility? Two other credits; Felix Golubev is one of the other producers, and Charlie R. Pellegrino is the other writer. Anyone who is desperate to see this and doesn't have access to The Discovery Channel will be pleased to know that the DVD is available for sale already. The programme is also accompanied by a book which is also for sale. Summaries of the deabte are being posted at two of my favourite blogs - Codex and NT Gateway. James Tabor is also advancing the arguments in favour at his Jesus Dynasty blog. Charles Halton at Awilum has posted the fifteenth Biblical Studies Carnival covering the best biblical studies related posts from February. It's presented with some much needed humour, and obviously features a number of posts on the Jesus Tomb film. Biblical Studies Carnival XVI will be hosted by Brandon Watson over at Novum Testamentum in April. Here's the Scene Guide for Lance Tracy's The Cross (my review). This one is a little different from normal, as one of the DVD options is to have bible references turned on. So the references given here are mainly the ones cited by the DVD itself. Those in brackets are additional ones I have included. Of all the gospels, this one relies most heavily on John. Much of the information from Gethsemane to Jesus's death is largely common, but where there are some differences, they often chose John in preference to the others. In particular the resurrection sequence almost solely reproduces John 20. This film also is one of the few to base Mary Magdalene more on scripture than tradition, although there is still a good deal of artistic licence. So nowhere does this film treat Mary as a prostitute. Instead we see Jesus heal her after she has self harmed / attempted suicide, and then exorcise her. Whilst we have no idea what impact, whichever demons Jesus cast out, had had on her this was an effective visual way of communicating the information, just as in Gibson's The Passion of the Christ the brief shots there communicate his take on Mary. One aspect that didn't ring true for me was Caiaphas recollection of Jesus as a boy. Early on in the film we flashback to the incident in Luke 2:41-51 where Jesus goes missing and is found "sitting among the teachers, listening to them and asking them questions". In this film we're shown a younger Caiaphas as amongst those teachers, and later on in the film the older Caiaphas recalls the incident and knows that these two Jesuses are one and the same. When I interviewed Lance Tracy, I wanted to ask him about the use of Matt 27:25 in the trial before Pilate. Whereas this sentence is only used once in just one of the gospels, here the crowd repeats it several times. Given the long association of that verse with anti-Semitism I was a bit troubled by it. However, this is also offset by the small size of the crowd in this scene. This is one of the few films where Pilate's court is shown, but is not crammed full. Such a small crowd off sets the possibility that this crowd could represent all Jewish people even at that time, and is a nice way of dealing with the scripture whilst still including it. Personally I wish they had just had the crowd utter it once (or not at all), but this is one of the most interesting scenes in the film for how it is shot.